In 2017 and in prior years, Sharon High School has participated in the Latino and African American Tenacity Challenge, which is an academic contest that gives students scholarship money. Last year, the theme was the Black Lives Matter movement. One of the challenges for this event was for students to create a poster that reflected this theme. Senior Aiyana Williams, along with Alliyah Marshall-Oates, Ben Jeter, Ionya Whyles, Darshanna Blaise, and Maxine Blake, who are alumni of Sharon High, completed the project last year. This year Williams asked if the poster could be hung up in the building to help and inspire this years students. With a green light from Dr. Libano, it was hung up in the cafeteria foyer. The poster was moved to the auditorium foyer which is when it was noticed by everyone from students to parents. Williams said that she understood how people could feel offended. “I understood that some students and parents were offender by the tagline on the bottom “hands up don’t shoot” and the headline “Black Lives Matter” which led to controversy. “People skewed the photograph of the banner the and context to emphasize their point and tried to invalidate the original point of view”. Officer Michael Hocking, the SHS resource officer, says he wasn’t offended by the poster, but understood why others felt the way that they did. “I’m not offended at all, but some officers are because they think that a certain section of the Black Lives Matter movement is anti police,” said Hocking. Williams said the poster was the beginning to a conversation that our community needed to have. “It’s evident that the Sharon Community isn’t as inclusive and open as they may seem. 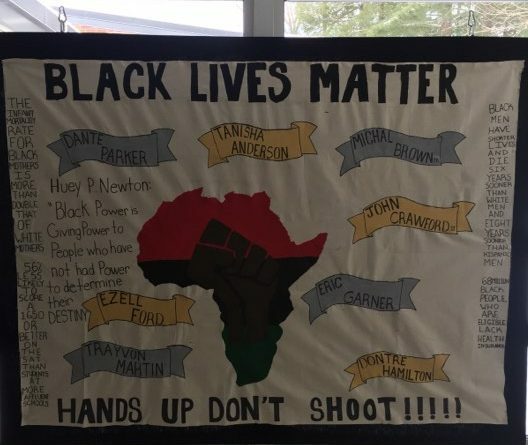 The banner sparked a conversation that’s been long overdue and has yielded commentary and initiatives from not only the student body, but the teachers as well and that’s the goal”. Williams said that she is much more connected to the poster since people have started to talk about it. “After seeing the uproar from the poster, I felt more connected to it. I’m the last person in my group from previous years to compete and that banner spoke to not only the theme but also our reality,” said Williams. Williams says the banner is important to many. “I and others alike have to face the harsh reality that comes with being black. This includes systemic oppression, discrimination, incarceration, inequality, prejudice, and brutality,” said Williams. Williams is hopeful to see more students talk about subjects such as these in the future. “I am honestly more hopeful about the underclassmen and fellow peers about the future because there was a variety of opinions to keep the conversation wholesome and ongoing,” said Williams. Dr. Libano likes how students are willing to talk about the poster and share their views. “I think it’s created some excellent dialogue among those coming from different perspectives,” said Libano. Hocking also said that he is glad that students, staff, teachers, and administration are having conversations about the topic. “I hope that this has actually opened the eyes of people and allowed people to talk about this issue as a positive teaching and learning moment,” said Hocking. He said that he has seen teachers in the building creating an open session for students to talk about their feelings and opinions on the poster. “I saw that Mr. Fazzio was doing an open forum in his class, and it’s good that classes are creating a dialogue among teachers and students,” said Hocking. Williams said this was necessary to provoke change in and around out building. “This is just the beginning for social growth and hopefully a change in the SHS…I hope they influence and encourage others to combat ignorance, hate, and inequality,” said Williams. Some found the saying “Hands Up Don’t Shoot”, offensive and anti-police. Deputy Police Chief J.J. McGrath told the Sharon Advocate that the poster was very offensive. “It’s obviously an attack on police officers saying they murdered a young black man,” said the Deputy Police Chief. McGrath also addressed the responsibility that people must have when it comes to the freedom of speech. “Administrators are the ones managing the school; students don’t dictate what goes on at school,” said McGrath. Libano also says that he is proud of the students for not backing down from opposing views and standing up for themselves. “I hope that people are proud to know that we have a school environment where it’s ok to have opposing views and where respectful disagreements can happen,” said Libano. Libano also says it’s important, “to have conversations about race, identity, privilege, etc. so that we can all learn more about each other and develop greater respect for differences, and backgrounds,” he said.